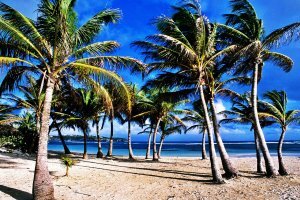 The economy of Guadeloupe is based on four main pillars which are tourism, agriculture, light industry and services. At present, tourism plays a key role in the country's economy, as an increasingly large number of cruise ships visit the islands. Agriculture accounts for about 15%. The main cultivated crops are bananas (which supply around 50% of export earnings), cocoa, eggplants, christophines, pomegranates, jackfruit, prunecafé, as well as many varieties of flowers. Light industry includes the production of sugar, rum, solar energy and other industrial products. Other industrial activities include food processing, cement and brick manufacture, mineral water bottling, beverage making, chemical making, textile manufacture and electronics assembly. The main exports of Guadeloupe are bananas, sugar and rum. The primary export partners of the country are France, Martinique and the US. Guadeloupe manifests a modern economy that is progressively transforming. The key economic sectors of the country are agriculture (15 % of the GDP), industry (17%) and services (including tourism; 68%). Businesses are at the basis of economic development of the island, and also contribute to the enrichment of the population. 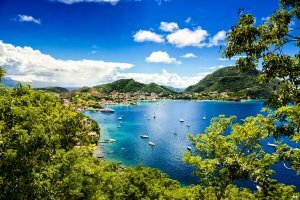 Guadeloupe is a French overseas territory and it is dependent on subsidies and imports from the mainland France which contribute to the island's economy. Guadeloupe also receives many food imports, from France and from other countries. Most manufactured goods and fuel are also imported. Guadeloupe's major imports include food products, fuel, cars, clothes, other consumer goods and construction materials. The country's main import partners are France, Germany, US, Japan and Netherlands Antilles. Guadeloupe is an oversee territory of France situated in the Leeward Islands, in the Caribbean. The island, like the other overseas departments, is an integral part of France, and as a result a part of the European Union and the Eurozone. However, Guadeloupe is not part of the Schengen Area. Being a French territory, Guadeloupe’s import policy follows the European Union regulations. Imports from non-EU countries are subjected to a Community Integrated Tariff (TARIC) system, and the tariff schedule is based on the Harmonized Commodity Description and Coding System. Import duties are calculated ad valorem basis. Products from African Caribbean and Pacific countries are exempted from general Customs Tax. Several taxes are applied: General Customs Tax, the Octroi de Mer Tax (OM), Additional Tax to the Octroi de Mer Tax (DAOM) and Value Added Taxes. The value-added tax is applied on the “tax excluded price”. All imports, except cigarettes, have an “overseas tax” of between 5 % and 25% of duty value.VAT must be added to the price of all goods and services sold. - labels should inform of any special sales conditions or limitations of the product. - Phytosanitary, fumigation or disinfection, zoosanitary certificate where relevant. As part of the European Union, imports from third countries (non-European Union countries) are subject to regulation. A limited number of products considered to be sensitive may require a specific import license.